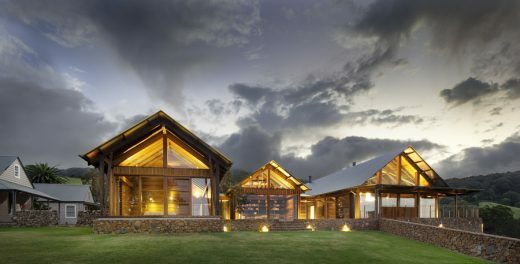 The design provides a new family house in the North West corner of this farm complex characterised by existing vernacular buildings including an old dairy, barns, sheds and cottages configured around an ancient Morton Bay Fig tree. Three gabled pavilions connected through a breezeway create a series of framed views through the building. Views to the North, West as well as the central courtyard to the South are captured while creating a series of private spaces and a large communal living/dining/kitchen. Carefully designed to add a contemporary layer of history to the place, the new building responds in shape, scale and proportion to its immediate surroundings. External materials are taken from the existing buildings pallet but given a contemporary interpretation and include local field stone, vertical Blackbutt lining boards with cover battens left natural to fade to a grey colour and Colorbond roofs. Internally, Blackbutt floors, wall and ceiling linings reinforce a strong timber character. The main pavilion features a dramatic cathedral ceiling with exposed recycled hardwood timber posts, paired rafters and scissor trusses. Gradually, the pavilion becomes wider and higher towards the North giving the living area spectacular views of the surrounding landscape and coast in the distance. The scullery behind the open kitchen is built as a low ceiling room within the main pavilion. Large timber sliding doors open up the house to a wide wrap around curved veranda to the North West.